Ugh! Sorry it's been so long since the last post, I've just been slammed with work and daddyhood, and I'm a terrible multi-tasker! A cel phone game I contributed a character to just launched for the Nokia NGAGE platform. Free to play online, so check it out at www.resetgeneration.com. They've been trying to market us as "celebrity designers" (yeah right!!!) so have a laugh at my profile here. 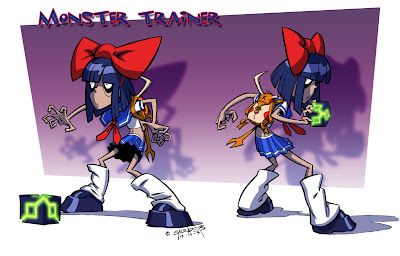 I designed the Monster Trainer character (supposed to be a riff on Pokemon.) Kind of a departure for me, they don't usually let me out of my tech cage to do cartoony work, so it was pretty fun to stretch those muscles. I'm pretty pleased with how it turned out, they stayed pretty faithful to the design. 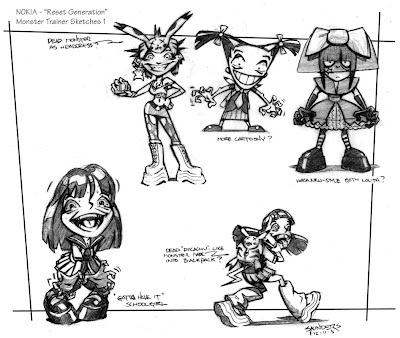 Below is the original design, along with a couple of development sketches. 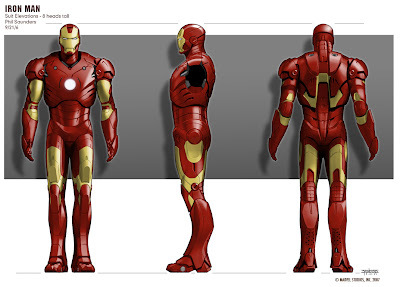 The suit design process involved a lot of ideation before settling down and refining the final Mk3 design. 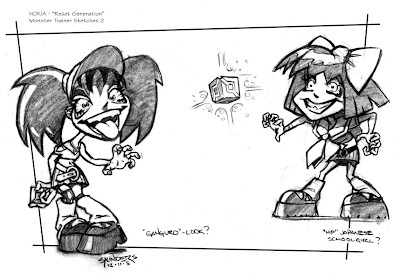 Below are some of the sketches from that exploration. This was kind of a shotgun approach, trying out a lot of different aesthetics and rendering techniques. 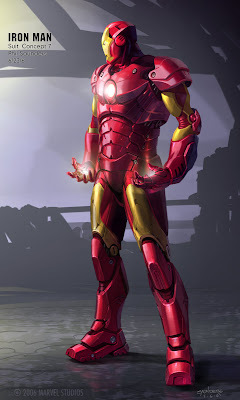 This first one was an attempt to try to update the color breakup of the original red and gold suit. This one is a lot more of a bruiser than the final production model, and I was exploring some form ideas to try to give the impression of solidity to the sheet metal, shearing off organic forms to create flat surfaces defined by strong edges. 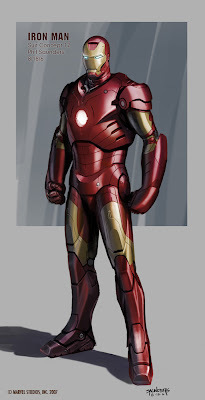 This was an approach that we ended up adapting to the final design in areas like the forearms & legs. 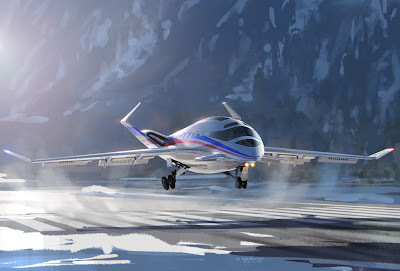 The next one came from the concept of "wearable ordinance" as an alternative to the more streamlined "wearable aircraft" approach that had emerged from Adi's original sketch. 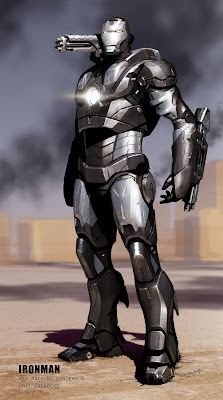 I referenced modern tank ablative armor, as well as medieval and roman armor. It had an interesting aesthetic, but ultimately wasn't iconic enough. This was an attempt at a more modular and organic approach, that would have used Electroactive Polymer Actuators (real-life artificial muscles that are being developed by JPL and NASA, using plastics that contract or expand when current is run through them.) 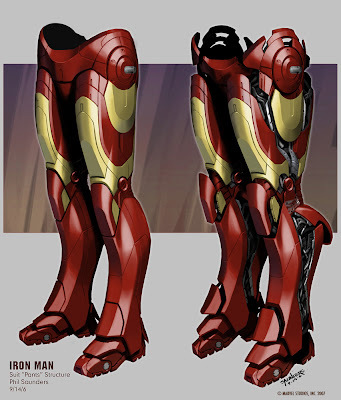 Jon noted that the audience expectation would be more mechanical, with miniaturized pistons, actuators & servos to connect with the metaphor of Iron Man. I think he went in the right direction. A more streamlined and athletic approach that tried for thicker overlaps between plates. 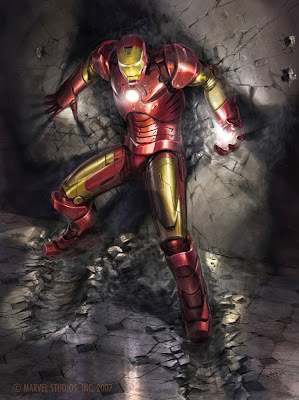 Jon felt that this was too much of a "swimmer's body", rather than the more powerful boxer's build he was looking for. As I think we all expected from the beginning, an evolution of Adi's wearable airplane design was ultimately the way to go. 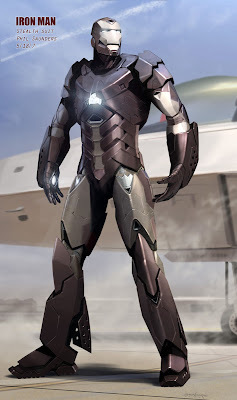 I also spent a lot of time in this phase working on a Mk 4 suit which would be a militarized version (can you say War Machine, anyone?) that was ultimately cut from the script. With any luck it will turn up in the sequel! By now everyone has heard about the passing of one of the greats, Stan Winston. Stan had been a hero of mine since the days of Terminator & Aliens, when as a kid I would pore over the pages of Cinefex and Starlog and dream of working alongside these masters of imagination. Well, by the time I got my chance, Stan had long since handed off the hands-on side of the business, but I did get to meet him & work closely with his talented crew on two movies, Zathura and Ironman. While I only had brief contact with him, he was always gracious and complementary of the design that my colleagues and I brought to the process. I have never had any work of mine treated with more respect or been more faithfully and masterfully executed as his team has done. Stan has left our industry with a legacy of some of the most iconic, memorable and convincing creations to grace the silver screen, always stealing the show from their flesh and blood stars. My sympathies go out to his family and friends and the long-time colleagues he leaves behind. 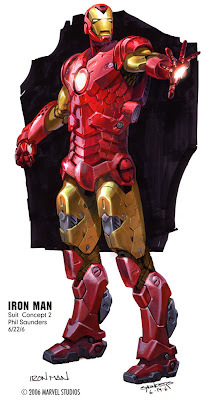 Just came back from New York, where Adi Granov & I spoke on a Costume Design panel at the Superheroes: Fantasy & Fiction symposium at the Metropolitan Museum of Art. Joining us was Gordon Smith of FXSmith, who was responsible for Mystique and Nightcrawler's makeup effects in the X-Men movies. Great guy, and a pleasure to get to know. Quite an inspiration to see how that work came together. Many thanks go out to Peter Coogan, Shannon Bell Price, Joseph Loh and our moderator Geoff Klock for making it such a pleasant experience for us. Adi took some photos of us in front of the exhibit, and I'll be posting them as soon as he gets back home from Wizard World in Chicago. The Metropolitan Museum of Art has put up a page of quotes by the designers of the costumes featured in their Superheroes: Fiction and Fantasy exhibit. Adi & I have our quotes HERE. Remarkable how we both seem to have come up with much the same thing to say about it, given we didn't talk about it beforehand. 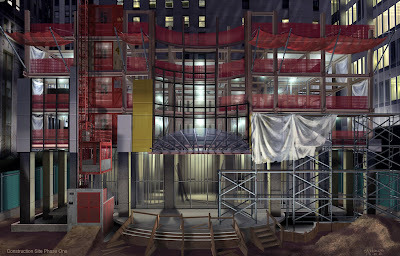 Just another example of what a great meeting of the minds this project was, if the final design wasn't evidence enough. 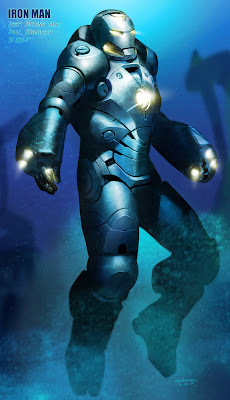 Below is a picture of the Mk2 suit in the exhibit, from the Met website. 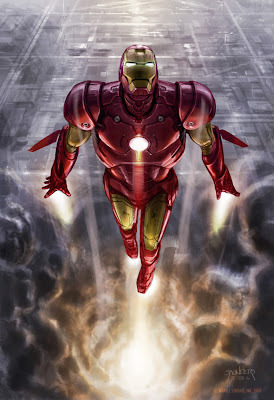 Adi Granov and I have been invited to participate in a conference at the Metropolitan Museum of Art in New York City on June 22nd, as part of a special exhibit put on by the Costume Institute, "Superheroes: Fantasy & Fiction." 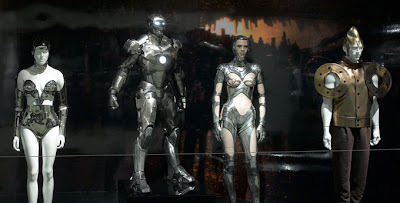 The exhibition is sponsored by Giorgio Armani and features movie costumes and the haute couture that they have inspired. 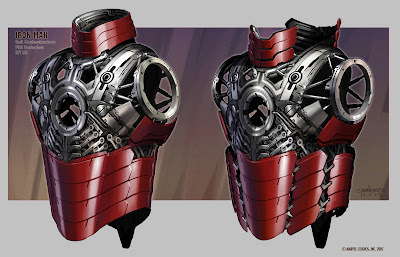 Our Mk3 suit is exhibited under the category of "the Armored Body," along with some outrageous Thierry Mugler chestplates & other biomechanical fashions. So if you happen to be in NYC, I'd love to see you there. I believe the conference is free to the public. You can find a link HERE. These have already been posted on conceptart.org for a few days, but it's been so busy I haven't had time to get them up here yet. So these are a few views of the living room interior. As with the exterior it owes a stylistic debt to John Lautner's famous Malibu homes. We went through a lot of variations of set dressing, the floor was originally cut stone, the area within the cylindrical glass waterfall/ spiral staircase was originally an arboretum, and there were creeping vines on the balconies (which you can still see in the east view.) The staircase started out as glass, supported by cast aluminum cantelever arms of graded heights fanning out from the glass, but structurally it wasn't feasable, so cast concrete steps similar to another Lautner house's were substituted. It actually makes the center a little cleaner. Essentially the interior is structurally unchanged from the original sketch though, and came out remarkably well in the final film. 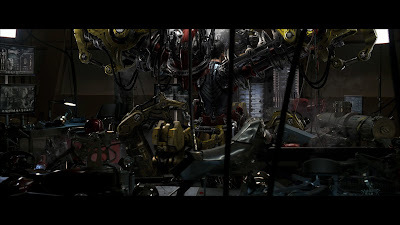 All told I'm very pleased with the results, as you can see in a frame from the trailer. 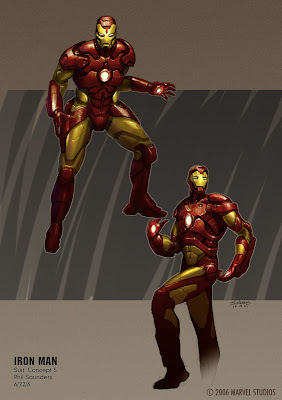 Here are a few of the final design renderings for the Mk 3 suit. The above is a nearly final iteration of the front 3/4 of the suit. 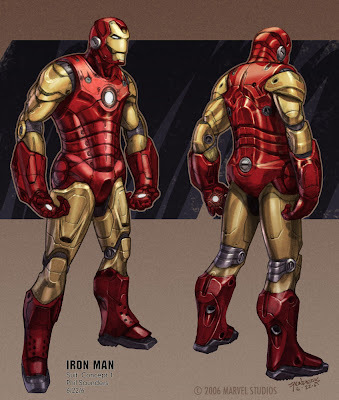 The lower boots changed, as well as the upper chest & trapezius muscle area along with some cutline details, but that's essentially what we went with. 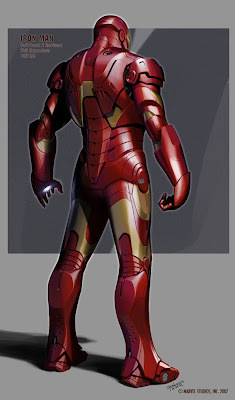 The final helmet design, streamlined by suggestions from Adi. 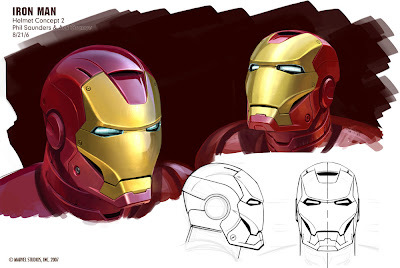 The final helmet was sculpted by Miles Teves, who added the more direct cheekbone cutline as seen on the final suit. Miles's awesome sculpt was scanned and mirrored at Stan Winston studios, but his surfaces remain essentially intact in the final casting.